Simply Silhouette: Wacky Wednesday #12 - Fruit & Veggie Theme! Wacky Wednesday #12 - Fruit & Veggie Theme! Paula is having over at More Than Favors. stamp set from My Pink Stamper. Create a Critter cut at 3”. tell you what the paper is. I love this card it is way tooo cute. I am going to check out their challenges. I haven't do too many but it looks like fun. What a great job. 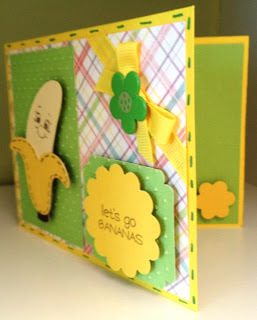 I sure do like it when there are enough scraps to use for another card too. 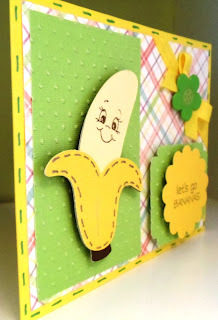 I totally love this Card! 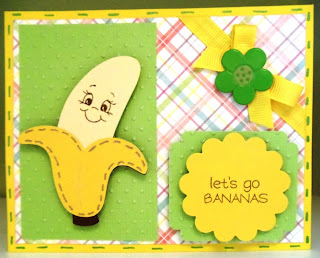 I think it Bananas B-A-N-A-N-A-S!!! LOL. Thank you for joining the More Than Favors Wacky Wednesday Challenge! SUPER CUTE!! Love the fun colors.